I'm a passionate photographer, likes to explore the world around trough the photos. Any subject is welcome. I love to open my eyes and "see" the beauty we are surrounded with and try to spice it up with some creativity. 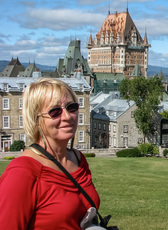 Born in Poland (Sopot), lived over 25 years in Germany (Hamburg), then sailed for 7 years in the Pacific, and finally settled in Quebec, Canada. Because of my travels, I had the opportunity to capture a host of images from a different parts of the globe. From 2010 until now all images are shot in RAW format. I hope you enjoy the works I have uploaded, the new or the older ones. Please feel free to give me your comments and suggestions as I believe that is an excellent way to improve our skills and also learn new ones. Watermarks visible on the images will of course NOT appear on a final print. Please note, all my images are subject to © copyright by Jola Martysz. Any publication, reproduction, modification, transmission, transfer, or exploitation of any of the content, for personal or commercial use, whether in whole or in part, without written permission from myself is prohibited. All rights reserved.